Cataracts refer to when the normally clear lens of your eye clouds over. In a nutshell, cataract surgery removes this hazy lens and replaces it with a transparent artificial intraocular lens (IOL). At Sullivan Ostoich Eye Center, Dr. Kevin L. Sullivan is a board-certified ophthalmologist and surgeon, expertly qualified and highly experienced in performing laser and cataract surgery. Cataracts may also interfere with medical treatment of another ocular condition, such as diabetic retinopathy or macular degeneration, as they can prevent a thorough eye examination of the back tissues of your eye. These are all reasons why your eye doctor may recommend cataract surgery. Dr. Sullivan will meet with you in Northwest Chicago to discuss your candidacy for the procedure. There are a variety of types of IOL’s available, with different features. To determine the best option for you, it’s advised to discuss the benefits and risks of each type with your eye doctor or optometrist. You may be advised to discontinue specific medications prior to cataract surgery, in case they raise your risk of bleeding during the procedure. To decrease the risk of infection, antibiotic eye drops may also be prescribed for a few days. From 12 hours before the surgery, you may also be instructed not to eat or drink. Start to finish, the entire procedure generally takes one hour or less and is done on an outpatient basis. We’ll walk you through the basic steps of what to expect. Your eye doctor will insert dilating eye drops and you’ll be given local anesthetics to numb the eye region. You may also be prescribed a relaxing sedative that will make you groggy but not put you to sleep. One of the most asked questions after cataract surgery is, are glasses necessary? For this, and all typical questions regarding cataract surgery, ask your Sullivan Ostoich eye doctor! Contact us at Sullivan Ostoich Eye Center to schedule a consultation. A cataract is a slow, progressive clouding of the eye's natural lens which interferes with light passing through the eye to the retina. 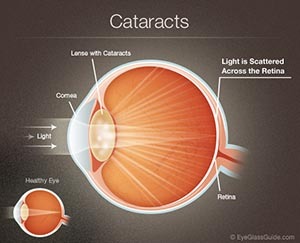 With time cataracts usually result in blurred or fuzzy vision and sensitivity to light. Cataract Surgery involves a lot more than clear vision. Today, premium IOLs can treat astigmatism or presbyopia. Some common questions regarding cataract surgery. Avoid glasses through Symfony's IOL - a premium implant that provides near & far vision. The Raindrop corneal inlay is a unique treatment for presbyopia similar to a cataract surgery. Solving myopia or nearsightedness can be an option through Visian ICL. Will you need glasses or contact lenses after cataract surgery? Does cataract surgery help prolong one's life? We believe so & here's why.